Friday’s jobs report was disappointing, but it also contained a truly heartbreaking statistic. Black teen unemployment is a shocking 41.6%. In July last year, the unemployment was considerably lower, at 36%. That almost half of black teens who want to work can’t find jobs is a stain on Obama’s economic policies. This isn’t a numbers trick. This isn’t a rate based on the whole black teen population in the country. This is the proportion of the black teen population that is looking for work but can’t find a job. Just in March, the number was eight points lower at 33%. The white teen unemployment rate is half the black rate, although still high at 20%. The heartbreaking thing is that these teens haven’t given up hope and left the job market, something that has artificially lowered the overall unemployment rate. 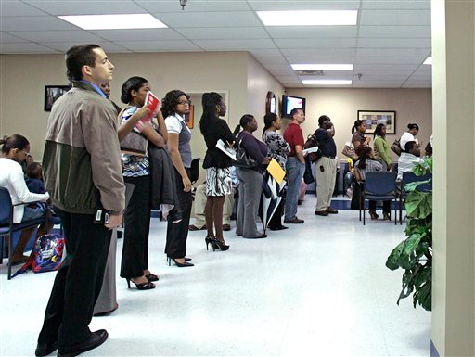 The unemployment rate is based on those who want a job and are trying to find one. In recent months, President Obama and national Democrats have increased calls to raise the minimum wage or impose “living wages” on certain companies in urban areas. Minimum wage jobs, however, are often “first jobs,” providing that critical first rung on the jobs’ ladder. Indeed, more than two-thirds of minimum wage employees receive a raise within the first year on the job. You can’t get a raise, however, without first having a job. Our economic policies are abandoning a generation and threatening to create a permanent underclass. It is shameful.